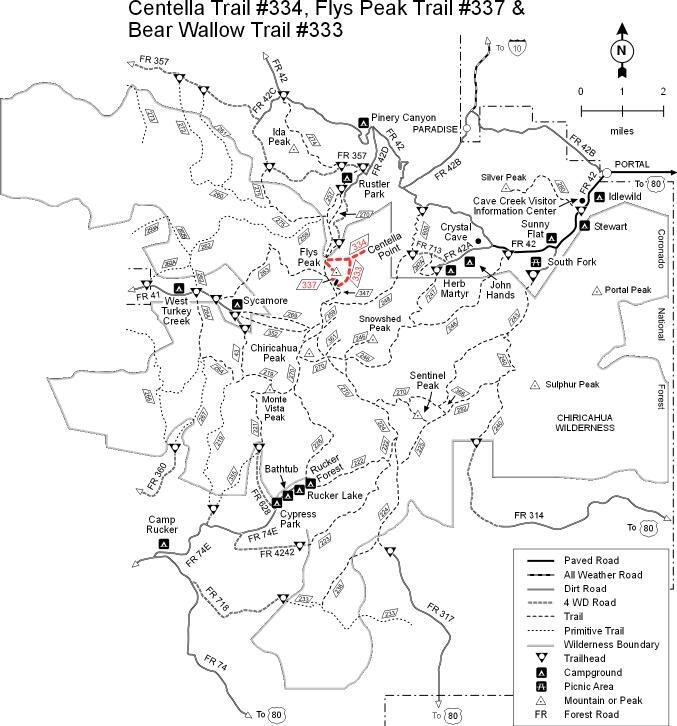 Flys Peak Trail #337 is a 0.75 mile one way hike with 574 feet elevation gain. Located 39 miles north-northeast of Douglas Arizona. Trailhead access is via a dirt road which is typically car accessible when dry. June and July are the best months to enjoy this hike. This trail branches off the Crest Trail #270 along the stretch that lies between Flys Park and Round Park, just south of the Wilderness Boundary. Centella Trail heads east from a junction where the Long Park, Crest and Flys Peak trails intersect. Flys Peak Trail goes up and over the top of that mountain's 9,666 foot summit. Along the way, it negotiates one of steepest climbs in this part of the Chiricahuas. A good overlook is available a short distance south and west of the summit.